How can I change the font size and style on my Samsung Galaxy A5 2017? 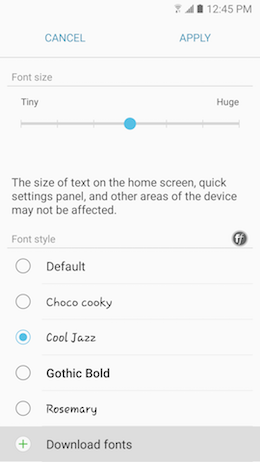 You can change the size and style of the font on your device, including downloading additional fonts from Galaxy Apps. 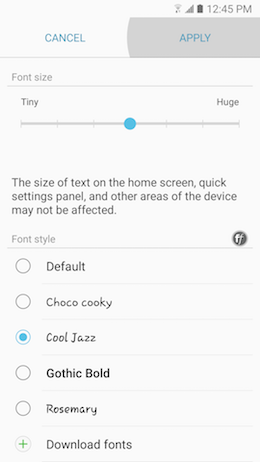 Changing the font size and style will affect the appearance of text on your device. 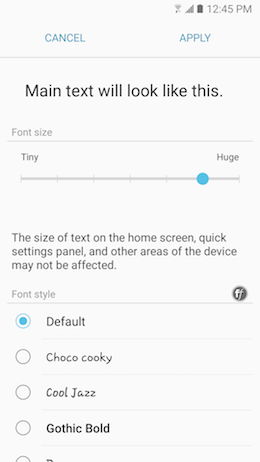 5 Move the slider to adjust the font size of your display font from Tiny up to Huge. 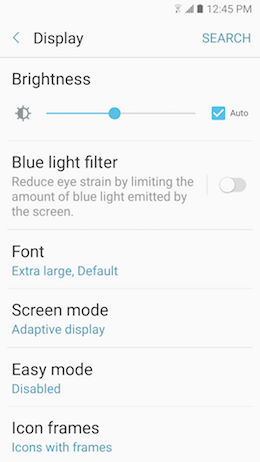 A preview of the font size will appear at the top of the screen. Note: When you select Huge, the font may be shown only in certain applications. 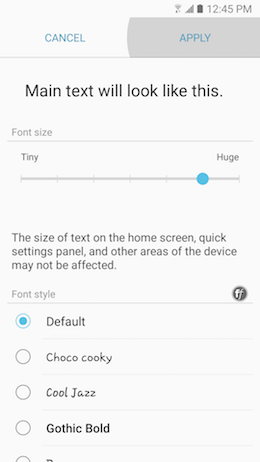 In applications that cannot support Huge font size, Large will be used instead. 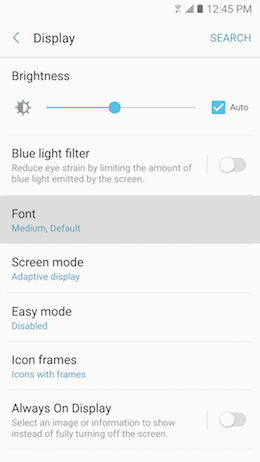 6 Touch APPLY to save the new setting. 5 Swipe through the available fonts. Choose Default, Choco cooky, Cool Jazz, Gothic Bold or Rosemary as the font style of your display font. A preview of the font style will appear at the top of the screen. 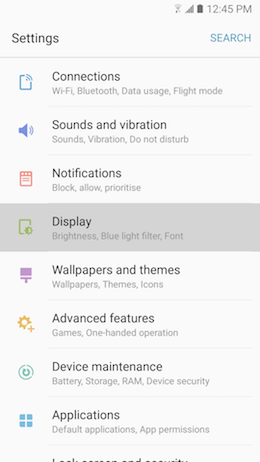 5 Swipe through the available options. 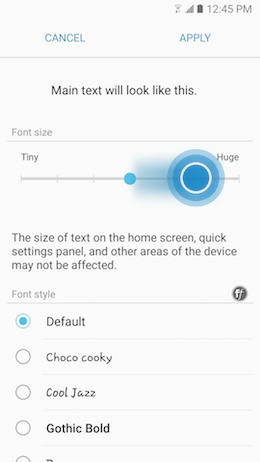 Touch Download fonts to purchase additional fonts or download free fonts from Galaxy Apps. 6 Swipe through the available fonts. The fonts are also organized by categories. 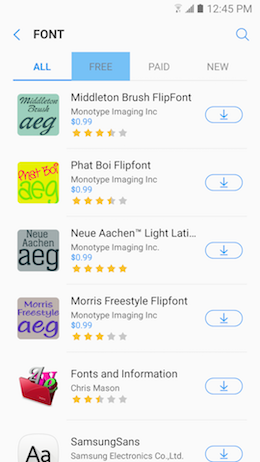 You can use them to find more easily the font you are looking for. For this example, we selected the category FREE. Then, touch the font you want to download. 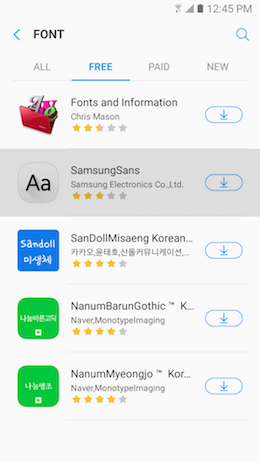 Important: A Samsung account is required to download a font from the Galaxy Apps store. 7 Touch INSTALL or the price of the font. 8 Once the font is installed, press the Back key two times to go back to the Display menu. Then touch Font. 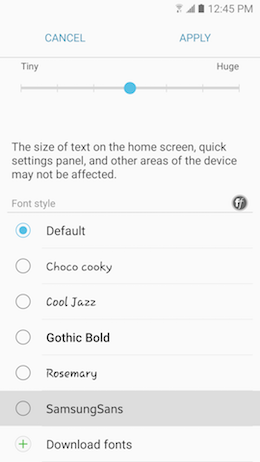 9 Swipe through the available fonts. Touch the downloaded font to select it. 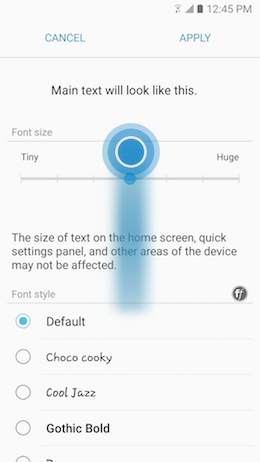 10 Touch APPLY to save the new setting. 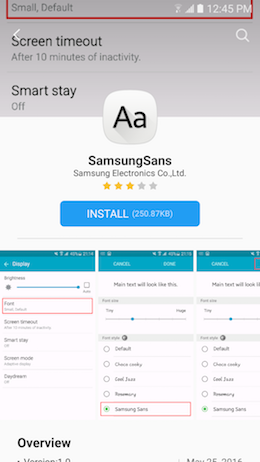 Warning: Some fonts obtained on your device by any other mean (in particular via the Google Play Store) might not work on your Samsung device, especially if it can't satisfy high security standards provided by Samsung. Please use this procedure to help protect the security of your Samsung device. 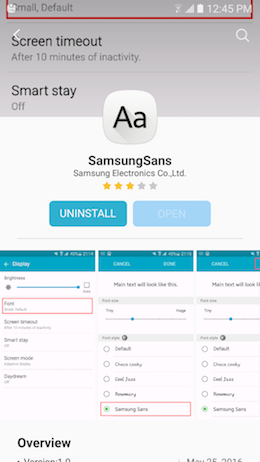 Galaxy A5 (2017): How do I take screenshots on my Samsung Galaxy A5 2017 (SM-A520W)?